Is it time to check your Fire Metal Door? Fireproof doors and installation in New York City, Manhattan, the Bronx, Staten Island, Queens, and Brooklyn. We also serve Westchester, Long Island, Nassau County, Suffolk County, Rockland County, Orange County and Putnam County in New York, as well as Bergen, Passaic, Essex and Hudson counties in New Jersey. Glass fire doors – this door with advanced fire technology, it’s just as good as any. – it’s important to realise that glass fire doors must be made from fire resistant glass. This means that the glass has passed the appropriate fire tests and has been certified fire safe. Door Repair NYC provides the best quality in fire resistant residential doors for the New York Metro area. We will custom make and install 1 1/2 hour and 3 hour fire rated hollow metal and kalamein doors with steel frames or with your existing frame, custom sized vision lights, and heavy duty hardware. A fire door is a door with a fire-resistance rating (sometimes referred to as a fire protection rating for closures) used as part of a passive fire protection system to reduce the spread of fire and smoke between separate compartments of a structure and to enable safe egress from a building or structure or ship. Fire-rated glass doors are the perfect solution for offices, conference rooms and lobbies where a fire door is required by code but a glass door is desired for aesthetics. 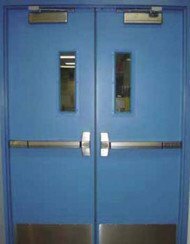 Rolling Steel Fire Doors are structural separations used to prevent the spread of fire and smoke throughout a building. These shutters, are compact and pleasing in appearance while permitting frequent opening and closing with optimal fire protection. Fire Shutters can be operated manually or with a motor and is activated by the melting of a fusible link. The Fire Shutters are ideal for small openings that require fire rated protection such as school cafeterias or any other place that require safety. Automatic closing fire windows and fire shutters means protecting windows close to boundaries has never been easier, call Door repair NYC for more information about Fire Shutters 212-202-0491. If your doors are fire doors, then they need to be kept closed at all times (unless being used, of course) to stop the spread of fire. This is achieved with door closers which can be uncomfortable as you want to move freely through your apartment without having to open heavy fire doors. Anther option is to use fire door retainers, these will keep the fire doors open, though. A fire door retainer will release the fire door and allow the door to close when there is a fire alarm going off.